The very best drill bits are made of high quality metal such as cobalt or titanium. The set should include all commonly used sizes, and small increments can be very important to avoid making holes that are too small for proper use or too large for a firm hold. The Chicago Latrobe 550 series is designed for heavy duty use making them perfect for when drilling into extra hard surfaces. The bits have a 135 degree split point that eliminates the need for a pilot hole and reduces the tendency of the bit to “walk” or spin off the mark. The bits range from 1/16” to 1/2”, with 1/64” increments that allow you to match the desired hole size. Each of its 29 drill bits made from hardened 8% cobalt steel, and come in lengths that are appropriate for many tasks without being so long that they bind and break. For even more strength, the web is thicker than the average drill bit, and the gold oxide finish provides natural lubrication so the bits stay sharper longer. While these are some of the best drill bits available, the steel container they come in is not as well made. The storage box will be fine for light duty or in the workshop, but will not stand up to heavy usage and the rough handling that is common on heavy industrial jobs. The only other complaint worth mentioning is that once a bit has been used a few times it will lose the factory edge, especially after intense drilling into heavy metal. They will still work fine for years, but will not cut through as quickly after a few uses as they did fresh out of the box. Match these up with a good cordless drill and you have an unbeatable combination. 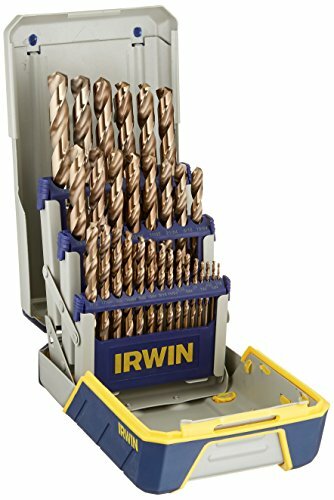 Irwin Tools is a popular manufacturer of light and medium use tools, and the 3018002 steel drill bit set is no exception. The bits contain 8% cobalt and hardened steel alloy for longer wear and reduced bending and breakage. The 29-piece set includes 1/16” to 1/2” bit sizes and a 135 degree split tip for easier starting. These bits will heat up faster than those with an oxide coating, which could lead to bending or breakage in heavy-use situations. The steel case they come in handy for keeping the bits sorted, but it will not withstand rough treatment, and the sorting racks are easily bent out of shape, leading to more difficult bit placement. The bits will lose their sharpness after one or two heavy uses, but they will last for years in light or medium applications. 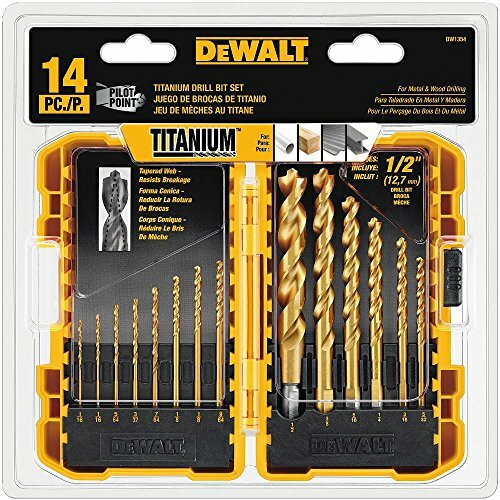 The DeWalt 1354 14-piece drill bit set uses a patented pilot point for easier starts, and come with a titanium coating to preserve sharpness. Sizes of the 29-piece set range from 1/16” to 1/2” and the web design pulls chips away from the work area and the bit to prevent clogging. The drill bits won’t spin under a bind the way some others do thanks to a unique no-spin shank design which is a big improvement over the typical round shank. They come in a handy plastic case that provides the same jobsite safety you would expect from DeWalt, a big improvement over the cheaply made steel cases of the other drill bit sets. While titanium is very hard, it is not quite as durable as cobalt, which means they will get dull a little faster. And since they will got hotter as the cutting edge wears down, worn bits will have a tendency to warp slightly during prolonged usage. 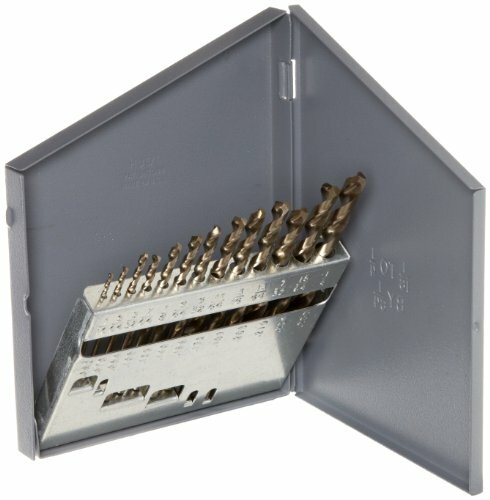 All in all, this budget drill bit set is an excellent value and perfect for infrequent use.